« Are Hostess Execs Running the Post Office? Fear and Crashing in the Everglades… And Parts Falling Off Too! Hunter S. Thompson woulda loved this place… If he were still ridin’ with us today, would he have stuck with the Duc and be on a Multistrada, or changed with the times to a KTM or Ural? Let me set the scene… Florida from Disney World south is a swamp, with the exception of thin ridges along the eastern and western coasts. Said coastal ridges quickly fell victim to the developers, and even the late bloomer Gulf Coast is pretty much the turf of multi-millionaires, the millionaires having been relegated to the inland condos and six figure motor homes for the clever ones. Theoretically there are public beaches, but if you don’t pay real estate taxes here they want $50 a year for a beach parking permit, or else feed the meters. Otherwise, it’s just a warm and flat hundreds of miles long suburb like any other, ‘cept for all the rich octogenarians fouling the plugs on six figure luxury and sports cars, and I hear they have ‘hoods in Miami, but I don’t go there much. Rapidly running out of ridge, the developers then proceeded to persuade us taxpayers to attempt to drain the swamp, with occasional success. Or spectactular failures, like the failed “Golden Gate Estates” housing development that left us the bare bones of a several thousand acre city, with dirt, gravel, and the odd paved and potholed roads to nowhere, out in the middle of nowhere. This questionable “asset” was soon put to use by drug runners, who found the miles long roads wide and sturdy enough to handle a DC-3 “freighter” while the conveniently located Gulf allowed said drug runners to go “multimodal”. The drug markets and logistics paths having shifted, the ADV dual sport motorcyclist crowd has discovered these ruins of a road system, and put them to use. Meanwhile, the state bought up much of the failed development and turned it into an underfunded state forest, while “the Corps” made plowing the roads back into the ditches that drained the area into a multi billion dollar “Comprehensive Everglades Recovery Project (CERP).” Thus our dual sport riders are greeted by unmaintained and unpredictable road surfaces, interupted by massive new pump stations, levees, and “spreader canals” and the construction machinery building them. 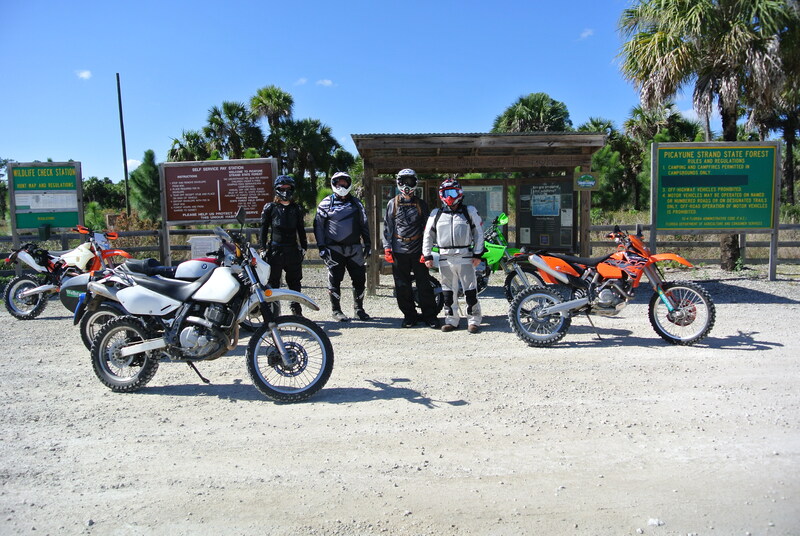 Throw in the spotty cell phone service, dozen or more miles to the Forest Service compound and EMTs, and the long ‘copter ride to the nearest level 1 trauma center in Miami… And this clearly ain’t our private MX track! Everybody behaved them selves pretty well on the paved road headin’ into the place, even had a four wheeler pass us. But once the pavement ended, the pace picked up to 60 or so, a decent ‘hack outfit can do that on gravel roads all day. We stopped at the park “gate” here and duly paid our $2 fees, then headed on at similar pace. I took exception to said pace when they turned off on a two rut cowtrail, slowing to 30 or so in deference to whatever potholes and bumps might be hiding in the vegetation. We last met up when they pulled off through a ditch, probably could have diagaonalled through it but didn’t want to chance it. I told them not to wait for me, and they didn’t… Back on the “main” road I slowed in deference to the occasional foot deep pothole, and they sped on. I rode around looking for a viable route to one of the other exits from the area, Janes Memorial Drive, with no success, then headed back to the Forestry Service compound/picnic area/campground for a break. Was munchin’ on a bar and surfing’ the web when two Forest Service fire rigs headed out, lights and sirens. The Forest Service two way radio was sorta audible from my picnic table, and a couple minutes later I heard “accident on Merritt”, then “get out your EMT kit” from the first to the second Ranger arriving on the scene. Merritt is closed for construction, even got security guards at the gates to make sure you don’t wander back there. Headed over that way and talked to the guard at the gate, a nice guy and a rider. He told me he thought it was a motorcycle accident, and he’d let four emergency vehicles through, including an ambulance. Here’s a better description of the accident scene and discussion since on ADVrider: http://advrider.com/forums/showthread.php?t=368848&page=185 It’s starts on page 185 on the “S.W. Florida rides thread in the “Flatistan” section of the regional rides section, in case the link goes dead.